The Keynesian conclusion that the equilibrium output level may be below the level that provides full employment for the labor force appears to be quite plausible on the basis of the arguments developed in Chapter 16. The conclusion that an economy’s equilibrium level of output would be only the level that provides full employment of its labor force appeared equally plausible to many generations of economists before the appearance of Keynes’s General Theory. 1 There were, of course, dissenters who argued against this conclusion long before Keynes did, but, nonetheless, the theory that aggregate demand simply could not be deficient became widely accepted. In this chapter we will examine an abbreviated model of the theory that denied the possibility of deficient aggregate demand and underemployment equilibrium, the theory that Keynes called the “classical” theory. Although our model is a classical one, the form in which we present it will nowhere be found in the writings of Ricardo, Mill, Marshall, or any of the other economists who were the creators and refiners of the classical theory. It was not until after the appearance of the General Theory that economists set to work to construct from the writings of the classical theorists complete models that might be placed side by side with the Keynesian model for comparison. Since, for simplicity, we will limit ourselves to the broad outlines of that classical model, we must note that our inattention to specific details amounts to inattention to the many qualifications that must be made to the conclusions we will draw. Nonetheless, the conclusions reached on this basis will at least suggest the directions in which the classical theory led. 1. John Maynard Keynes, The General Theory of Employment, Interest, and Money, Harcourt, Brace & World, 1936.
is specifically classical theory as it was before Keynes’s General Theory. As we will see below, the quantity theory of money is an essential part of classical theory, but today there is a “modern” version of quantity theory that differs markedly from the old version that was part of traditional classical theory. We will touch on the modern version in a later chapter; here our purpose is to cover the essentials of classical theory before Keynes, and so it is the “old” quantity theory that is examined as a part of that theory. Beyond this, not all classical theory relating to the determination of aggregate output and employment was disputed by Keynes. We have encountered parts of this generally accepted theory in the incomplete Keynesian model already developed. Here we will bring in the other elements of the classical theory and show how it led to the conclusion of automatic full employment. 2. General Theory, pp. 378-79. This is not to say, however, that the theory of distribution that was developed by classical economists is the last word. Although Keynes accepted this part of classical theory for his purposes, the very ground broken by Keynes in the theory of aggregate output and employment gave rise to a new interest in the macroeconomic aspects of income distribution. See, for example, S. Weintraub, A General Theory of the Price Level, Output, Income, Distribution, and Economic Growth, Chilton, 1959, and N. Kaldor, “Alternative Theories of Distribution,” in Review of Economic Studies, Vol. 23, 1955-56.
any given W more labor will be hired beyond an initial equilibrium only at a higher P, or at any given P more labor will be hired only at a lower W. 3 The level of employment consistent with profit maximization may alternatively be described as the level at which MPP = W/P or the level at which MPP equals the real wage (which is the ratio of the money wage to the price level). Thus we might say that the amount of labor hired is an inverse function of the real wage. With a given production function and an initial equilibrium at which MPP = W/P, an increase in employment is not possible without a decrease in the real wage. level, so, in that theory, cuts in money wage rates become a means of reducing the real wage and thereby a means of eliminating unemployment. The curve SL in Figure 17-1 shows that the labor supply is, like the demand for labor, DL, a function of the real wage W/P. But the labor supply is a direct rather than an inverse function of the real wage. This expresses the contention that a higher money wage will not call forth more labor if the price level rises proportionately, for in this event the real wage remains unchanged. For the same reason a lower money wage matched by a proportionate fall in the price level will not lead to a reduction in the quantity of labor supplied. The basis for this postulate of classical theory is the unpleasantness or irksomeness of more work; a larger real reward is necessary to induce labor to provide an ever larger supply of labor services. Workers, as well as the firms that employ them, are maximizing units in this system. Firms will not hire more labor at a lower money wage rate if the prices at which they can sell their output falls proportionately with the money wage rate. Of relevance to the firm is the cost of a unit of labor relative to the price at which the firm’s output sells -it is the real wage that counts. By the same token, workers will not supply more labor at a higher money wage rate if the prices of the goods purchased with their wages rise proportionately with the money wage rate. Of relevance to the worker is the money wage received per .unit of labor supplied relative to the prices of the goods that can be purchased with that money wage - it is the real wage that counts. This maximizing behavior on either side of the market for labor gives us the demand curve for labor as an inverse function of the real wage and the supply curve as a direct function of the real wage. The intersection of the supply and demand curves for labor determines the level of employment and the real wage and, one step removed, the level of aggregate output. 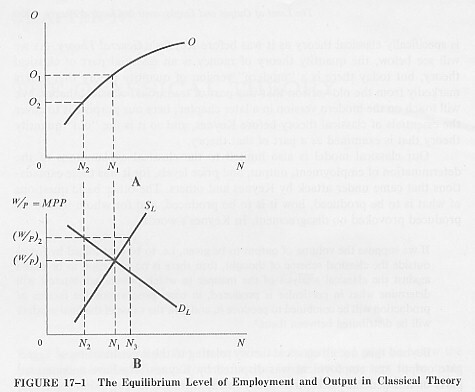 With a real wage of (W/P)1 in Figure 17-1, there is equilibrium between the supply of and demand for labor. At this real wage, employers choose to hire N1 of labor and workers choose to provide N1 of labor. With the aggregate production function of Part A, employment of N1 indicates aggregate output of O1. 4. We will later see that adjustment could be brought about entirely by a rising price level, but since we have not yet worked into the analysis the classical theory of the determination of the price level, it is best at this point to assume a constant price level. of a constant price level, means a falling real wage. A falling real wage means that employers find it profitable to hire more labor (a movement down the demand curve) and that workers choose to supply less labor (a movement down the supply curve). Once the money wage has fallen by the amount necessary to reduce the real wage from (W/P)2 to (W/P)1, equilibrium is reached. Employment has risen from N2 to N1, and output has risen from O2 to O1. If we had assumed instead an initial real wage below the equilibrium real wage, the adjustment process would be similar. However, in this case there would bean excess demand for labor and competition among employers that would bid up the money wage by the amount necessary to raise the real wage to its equilibrium level. The equilibrium level of employment so determined is also the full-employment leve1; that is, at this level all those who are able, willing, and seeking to work at prevailing wage rates are employed. Since any other leve1 of employment is a disequilibrium level, a familiar proposition of classical theory is that the equilibrium position in the market for labor is necessarily one of full employment. Whatever unemployment, apart from frictional unemployment, persists in the face of this equilibrium must be voluntary unemployment. For example, with the equilibrium real wage established at (W/P)1, any persons who are unemployed are considered to be voluntarily unemployed if they are seeking work but will accept work only at a money wage that, at the existing price level, means a real wage greater than (W/P)1. They are seeking a real wage that is inconsistent with the marginal productivity of their labor, and in effect they are “pricing” themselves out of the market. Given our previous assumption of a constant price level, there is in the classical system no barrier to full employment or to the elimination of involuntary unemployment as long as labor is willing to reduce its money wage as required to produce that real wage at which all who wish to work will be hired.